Antonio Literes, a boy soprano from Majorca, had, we may presume, friends in high places. He was summoned to the royal chapel of Carlos II in Madrid and there learned enough about music, after his voice changed, to enjoy a career as a composer of “zarzuelas” until his death in 1747. An Accis y Galatea is listed in Loewenthal as premiering at the Buen Retiro palace in 1708, traveling on to Lisbon three years later. Los Elementos, which had its American premiere on Thursday, is of this period. Zarzuela is a word that, like opera, meant different things in different times and locales. Zarzuelas have come to mean Spanish operettas; in 1708 they were palace entertainments, grand or light as the occasion demanded, resembling an English “masque,” poetic sung and danced allegories noted for bizarre special effects. Los Elementos seems to have been composed for the birthday celebration of a duchess. It was, in short, a sophisticated entertainment. The characters are Water, Air, Fire and Earth, and they quarrel for supremacy in a style familiar to us from the allegorical prologues to Monteverdi’s and Cavalli’s operas. The quarrel lasts all night long (Dawn comes up and Time passes), but at last day breaks, the chariot of the Sun enters from the East and all unite in the praises of Apollo. It is possible, the New York City Opera program notes suggest, that this was a political allegory of the triumph of Philip of France (grandson of Le roi soleil, Louis XIV, you know) over Charles of Austria in the War of the Spanish Succession. The Spanish Empire had plenty of money and plenty of talent, and its archives are full of wonderful little-known seventeenth- and eighteenth-century music. Baroque operas are one of the troves being plundered with success across Europe—and in Boston, Toronto and Oakland, as well—but there is no baroque opera troupe in New York to share this wealth and delight the enormous local audience for such music. This is one of the needs the old City Opera addressed with its popular series of Handel and Monteverdi productions, and there are a hundred other composers worth examining. The new City Opera’s choice of Los Elementos seems designed to appeal to that audience. The piece is being presented, through Sunday, in the small, elegant theater at Harlem Stage, an octagonal brick 1884 erstwhile portal in the city’s old reservoir system, on 135th Street and Convent Avenue, on the southern edge of the CUNY campus. The production makes use of elaborate projections by John Farrell to illustrate the unchained elemental forces while they themselves boast of their power (the projections background but do not obscure the performers) and television screens to keep the singers in sync with ten musicians of the City Opera Orchestra led, from the harpsichord, by Pacien Mazzagatti. The performers, allegorically costumed by Janet O’Neill, are in constant movement (the director and choreographer is Richard Stafford), air “breezy,” water “flowing,” fire “sparkling” and so on, the chorus (in silvery court frocks and wigs) move easily as well, and there are a couple of dancers schooled in baroque style. The lighting design is by Shawn Kaufman. It is a sophisticated and pleasurable entertainment. I’d be curious to know how much “editing” went into producing this swift-paced seventy-five minute edition of Los Elementos. Recitatives are brief and to the point (this is often a sticking place for modern audiences, but Los Elementos has no elaborate plot to explain), and the arias do not wander on forever in da capo surfeit. There are many occasions when singers harmonize, two or even four of them joining together, in a way unusual in Handelian opera. Elements do work together, you know; there’s no reason they shouldn’t harmonize to produce alchemical humors. I’m sure that would be Maestro Literes’ explanation. Samarie Alicea, in a horned headdress, sang and wafted Air with luscious ornaments and gestures. Chelsea Bonagura was her initial adversary, Water, in a mezzo appropriate to a cooler, more liquid coloratura. Melanie Askar, wearing brown for Earth, was also a lower voice and a soothing, luxurious one. Kelsey Robertson had the flamboyant sparkling top for Fire. All four maintained their pride of place without getting into invidious insult about mud or quicksand or sleet or scorched earth. Magda Gartner, as Dawn, calmed them all down a bit arrogantly, singing of her love for the coming of Day, but that special effect was not illustrated. Marco Nisticò sang hoary Time, and his baritone rumble was the only voice that seemed to have an awkward time with Literes’ grandiloquent and frilly phrases, perhaps because the role was composed for another treble; giving it to a baritone was a concession to modern taste. The melodies had a half-familiar Spanish tang to their rhythms (castanets sparked many of them), and the dancers’ gestures evolved from traditional Spanish steps. Spanish culture holds its own against even Italian style; you will hear very similar melodies, modernized and electrified, in the bodegas you pass on the way from the theater to the subway. 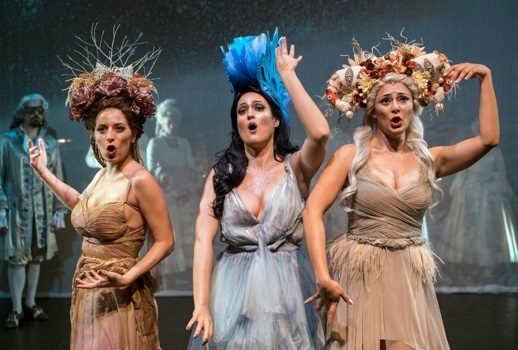 This sort of originality in programming, wit in staging and expertise in presentation are exactly what this writer hoped for in the revival of the City Opera. A most enjoyable show, charmingly executed. And for any duchess planning an occasion, Los Elementos with this elegant cast, would entertain any crowd imaginable between the formal dancing, supper and the faro tables.